Review response templates make it faster and easier for you to resolve issues with your customers. And that's important. More than half of consumers (53 percent) expect you to respond to their reviews within a week. Now, Google sends alerts to consumers whenever brands respond to their reviews. Whatever way you cut it, you'll need to streamline the way you respond to reviews. 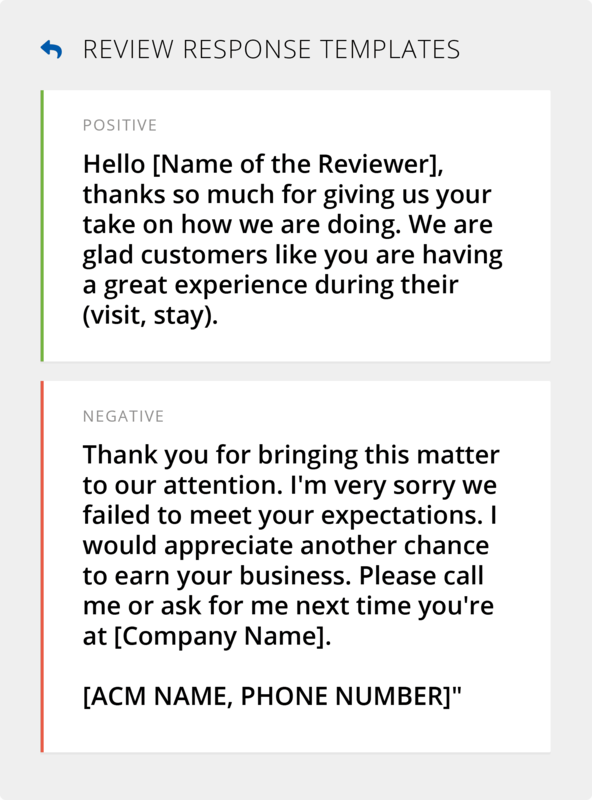 Use these templates to nip customer issues in the bud, encourage positive reviews, and manage your reputation on any review site. Reinforce positive feedback and connect with your promoters. Take negative comments offline and resolve customer issues faster. Show your customers how much their feedback means to your business by responding to every review.